It is interesting to look at the differences that we find between the information obtained from the Marti Report and that of the original typed Ford Special Order Form (DSO). Order Date: The actual order for this car (DSO 2512) was typed on August 9, 1966, approved on August 11, and stamped "RECEIVED" on August 12. The earliest first date on the Marti Report for this car is August 16, 1966. My suspicion is that the Marti Report's "Order Received" date is actually the date the order was keyed into the Ford computer system -- which is later than any of the three dates found on the Special Order Form (DSO). Dealer Code: The typed DSO indicates "71x999," where district 71 = the Los Angeles ordering district. The Marti Report indicates "84x999," where 84 = Home Office Reserve. Research of the 67 Shelby DSOs has verified it was changed when Ford's Ray Geddes displaced Shelby's G.W. "Jerry" Nuznoff in October 1966. The orders began to use district 84 when Geddes began placing the orders. In summary, the convertible was ordered under district 71, however, the district was changed to 84 before this or any '67 model year cars were actually built. Wheels: The DSO shows the car was ordered with "Customer Supplied" wheels and "E-70-15" tires. The Marti Report relies on the Vehicle Order Image which has the default value of 1 in field #48 as 7.35x14 tires. The special itemization on the DSO would of course override the standard value, and this is something that the VOI has no way of accommodating. Rear Axle: The DSO indicates the car was ordered with a regular 3.25:1 axle. The Marti report indicates a an axle code of "1" which decodes to a regular 3.00:1. Same explanation as above that the DSO itemization would override the Order Image. 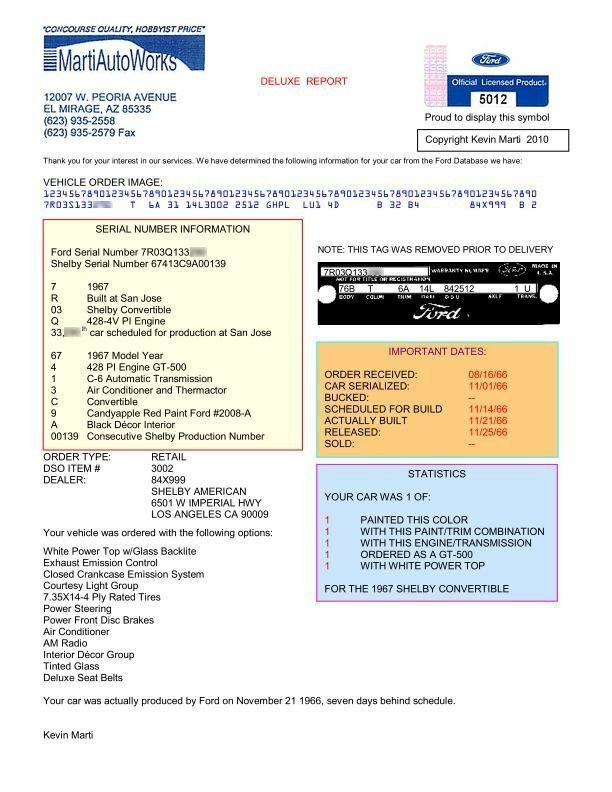 Engine Code: The Ford Vehicle Order Image image shows the VIN having an "S" which would normally denotes a 390 cu.in engine, however, the DSO shows the car was ordered with a 428 2x4bbl. The Ford invoice also confirms the car was equipped with the "428 Inter Engine" that was originally ordered (using line item wholesale costs: $81.00 for the base '289 2V 8Cly Engine' plus $114.02 upgrade for the '390 4V Thunderbird Special 8' $114.02 plus the $105.00 upgrade for the '428 Inter Engine').